Welcome to the home of the Staley Middle School Honor Band! We are the Non-Varsity ensemble of the program. Honor Band is the next progressive step for students after Beginning Band. Our ensemble serves as the "training ground" for Symphonic Band. What is going on in rehearsal this week? Parents, now that your child is in Advanced Band, there are higher expectations. Also, students have picked up an extra elective and may find that s/he may not have as much time to devote to the instrument as in Beginning Band. 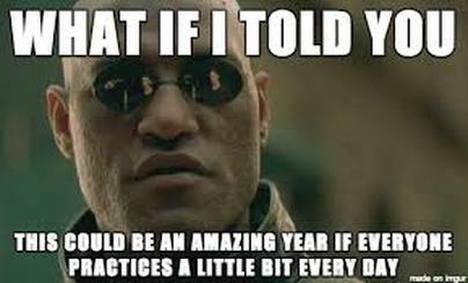 Individual Practice Time is important to the development of the player, section, and ensemble. There will be moments of frustration that naturally come with learning a musical instrument, but we [parents and directors] must do our best to inspire students to continue to make progress every day. Please read the following article: ​Motivating Students to Practice. "It's Not About Me - It's About US"
This is the motto we have adapted for UIL Season. Every player has a role in our success, but we understand that no one is more important than another or the band in general. NOTE: Sectional days and times are subject to change from time-to-time due to certain events that may arise in the schedule. Most Sectionals will be rescheduled to occur during class. Progress Journal GRADES are due every 3 weeks (the first week of the IPR and RC grades). Directors will be checking PJ's EVERY week for time and signatures, but we are only assessing grades every 3rd week. Parents please mention your child's name in the body of your comment, especially if they have a different last name than you. Thank you.